Best Tips for the query of "What to Do on Boat?" Nice experiences, usually come with a trade-off. In this case, swimming in the turquoise waters of Kos may take a great sacrifice: spending endless hours on the ferry. Having travelled a lot around the Greek Islands for most of our own summers, whether with our families at first, then with our friends or as lovebirds, we have some tips for you to make your life easier! Are you allowed to bring food with you? Yes of course! Actually, you are not only allowed, but you are advised to. To be clear, there are canteens at the ferries, where you can find snacks, beverages and sometimes complete meals. It is always a nice idea to eat something when you are bored and if you don’t want to spend your whole vacation budget on board, then you should probably bring many homemade snacks. Prefer something that doesn’t need specific care and try to be thoughtful of the other passengers too. In other words, eggs and onions are not a good idea, as their indiscrete scent will follow you during the whole trip. Granola bars, toasts, nuts, juices, sandwiches and fresh fruits can be great companions! The availbility of WiFi differs from boat to boat. Usually you must pay the Wifi connection per hour of use. 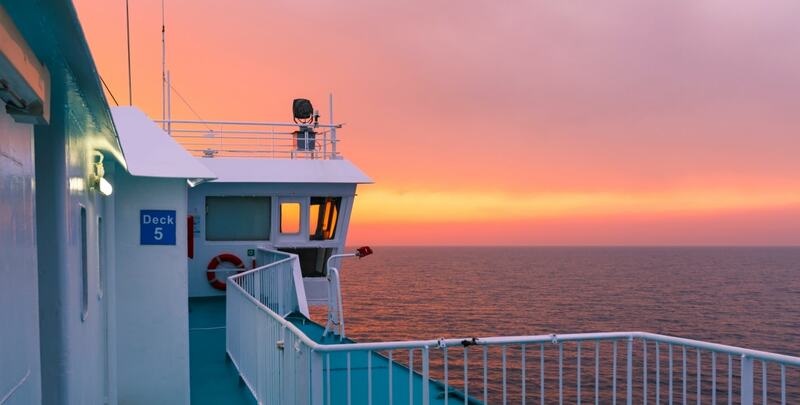 You can always try to use the Internet from your mobile connection but be prepared: there is no guaranteed internet or mobile connection in the middle of the sea! 220V AC sockets are available on all ferries around Greece! Not all of them work properly, so be sure to find one at the beginning of your trip. Remember that in Greece we use "Euro" standard "Type C" sockets. These are different than those used in the USA and the UK, so be sure to bring an adaptor with you! There are toilets on every ferry boat (bigger or smaller). We advise you to bring paper with you, in case there is not enough. A very important tip is to avoid visiting the toilets exactly before the disembarcation, because they will be crowded! Sometimes you can be very cold during a ferry trip, even if it is summer. Be sure to bring something warm to wear on the boat. Alternatively, a blanket is always a good idea, especially if you are travelling with kids. Some ferry routes to the Greek islands are more than 5 hours, so you should wear comfortable clothes and shoes! If you are travelling with company, you will have the chance to spend some quality time together. Games like Monopoly, Cluedo, Uno, Jungle Speed and so many others provide the perfect opportunity to test friendships and family bounds! By arguing, laughing and playing only one thing is granted: you will arrive in no time! Usually there are screens around the boat, but not for showing movies. You can watch the program of a Greek television channel, muted. So, if you are travelling alone, or as a couple a great idea is to download beforehand your favorite movies and episodes. Be sure to download them, because there is no guaranteed internet connection on board. Try to sit somewhere close to a socket and enjoy the rest of the trip! Books and ferries are an incomparable combination for the beginning of your vacation. Choose your books wisely as they will accompany you during your vacation. However, bringing many books with you will add extra weight to your luggage and some of them may get damaged during your trip. A clever alternative is to download your favorite books, comic books and magazines onto your smartphone or tablet. You can find a great variety of documents for free and download them in pdf form, or you can even buy your favorite e-books from various applications. Reading a book or watching a movie are great ideas when your trip is smooth. However, if the weather is windy and the sea is full of waves, you will probably get nauseous by doing the things above. Then comes the music! Be sure that you have downloaded your favorite playlists, albums and tracks to keep you happy throughout a difficult journey. Do not forget to bring your headphones and a power bank! An extra Tip - especially if you have children - is to download some audio books! Bring a blanket or a jacket. Air-conditioning can be a little over-effective. Comfortable clothes and shoes are also advised. It's your vacation, relax! Finally, do not forget to bring a first aid kit and in case of getting sea-sick you may ask for Dramamine at the reception desk of the boat. How can I book the ferry tickets for the Greek Islands?? In Ferryhopper we specialize in providing you with all the available ferry itineraries and show you the best prices for your ferry tickets. You can find the most up-to-date ferry schedules and directly book your ferry tickets for the Greek Islands using our innovative ferry booking engine, in just a few clicks!